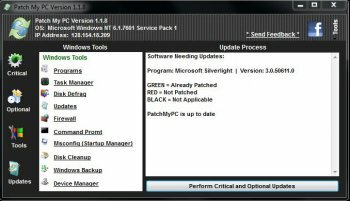 Patch My PC is a portable and reliable utility designed to check your system against the current version of Adobe Reader, Adobe Acrobat, Flash, Firefox, Java, and Quicktime. 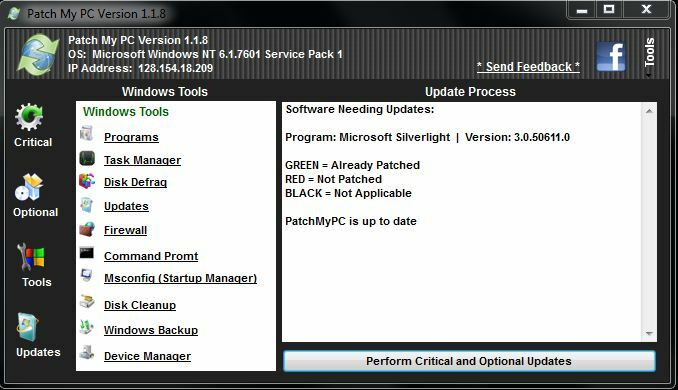 When started it will scan your computer for the latest version of this software if your system does't have the latest version it will show up as red, and when you click update it will download and install the latest available updates for the software found on your computer. With the aid of this application, you will be always up to date. Since no review since 2013 this should be updated so will go for it. Program is stand alone so is perfect. Nothing else seems to be included. Program seems to do what it says, programs updated fast and easy & quick. Has a large list of programs, possibly could do with more. This does not distract from what it does do & quickly with a small foot print. Recommend this program to save time. Now only if it could do drivers as well. This software is awesome. It even updates itself with your permission. It is packed with lots of options and comes with a scheduler. This app will also check for Windows Updates for you. Oh and PMPC watches for way more apps than what it mentions in the ad. Only one of this type updater that really works! The silent install threw me for a moment. Now if they would add AVG Free, Klite codec packs, and a few others. Wow. Only 312KB on my disk. The app is now smaller and better since my last review. The author of this app is onto something great and will catch on with the public in due time just like Ccleaner has. @CyberDoc: While I agree that ninite has it's place, this utility is actually easier because you don't have to update your USB stick every other day... this program downloads and installs the most important things all by itself. This program does exactly what it says. I fully appreciate the new ability to remove specific programs from being downloaded and installed (i.e. Firefox) - not all the programs that were being downloaded and installed automatically were needed. This program is a GODSEND to the computer repair industry. Previous to this, I had to use Ninite or Ketarin to keep the main programs updated that I needed every day. This program literally saves me 15 minutes on EVERY computer I work on... that works out to 300 minutes per day on average that I don't have to spend physically clicking buttons to install programs that are needed on new builds - like Flash, Reader, Java, etc. Only 476 KB on my disk is hardly bloated. I was surprised to see that my Firefox browser and iTunes were out of date. It even downloads and updates these apps for you. It's portable and best of all it's FREE!